Many boats have a separate grey water tank, holding dirty dish water or shower water, and Elemonate is an advanced way to stop odors that may be coming from the galley sink. 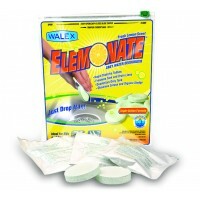 Just dissolve the handy lemon scented, rapid dissolve tablet in your galley sink and Elemonate will dissolve grease and organic sludge and eliminate any offensive odors. One tablet treats up to a 60 gallon grey water tank. Elemonate is a mix of biodegradable sufactants, odor control, and special enzymes for grease.